Daniel’s 4th birthday party cake theme was decided when I started chatting to Amy-Lee from Puppet World about puppet show options. If you have a house full of energetic, sugar-filled kids in winter, it’s pretty important to find something to keep their attention. The puppet show was fantastic, with adults and little people entertained and involved for a good 45 minutes with songs, snapping crocodiles, mermaids, and red Indians in feathers. The dad’s seemed to enjoy it too, mind you. 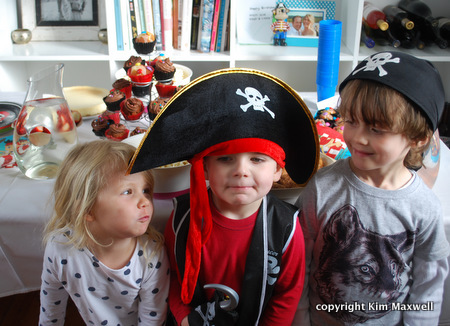 The party was a great excuse to buy the book about Peter Pan and the children who went to Neverland for adventures… So the dress-up theme also became Peter Pan and pirates. That made the cake easier. 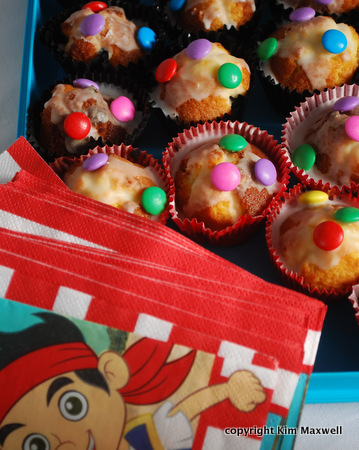 I figured that if had a treasure chest made with chocolate logs walls, holding colourful jelly beans and edible gold balls, I’d surely have satisfied kids who would have something to pick off the cake once the candles were blown out. I was right. 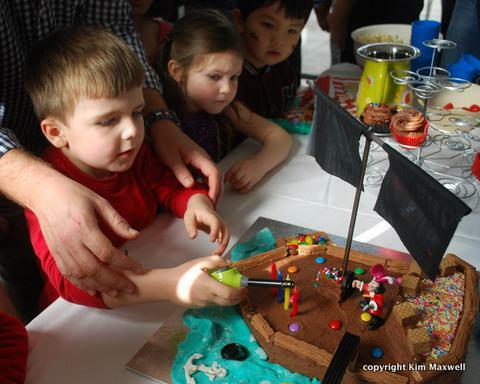 Captain Hook came from a toyshop, but otherwise the beer box cake and its decorations were edible. Chocolate butter icing, chocolate logs, chocolate balls and assorted sweets. 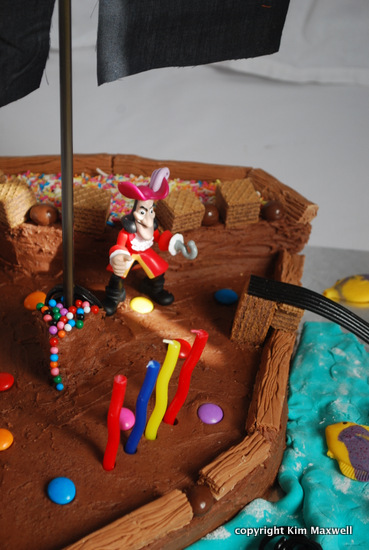 Wafer biscuits, sprinkles for decoration, and liquorice as a gangplank. The only exceptions that we didn’t care to eat, were the icing anchor, fish and rolled out turquoise plastic icing ‘waves’ I found at Cab Foods. Black sipping straws and fabric were made into pirate ship sails. We also had gingerbreadmen, popcorn, and cupcakes iced simply with a paste of icing sugar and water, topped with smarties.